You wouldn't think that much money could be made from selling a $20 phone. But a breakdown of the low-end Nokia 105 by IHS shows that even after paying $14.20 for the materials, components and manufacturing cost, the Finnish handset maker still makes a decent amount of money for each unit sold as the hardware and manufacturing margin works out to 29%. 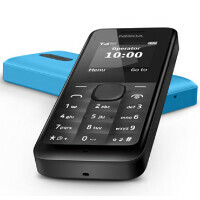 The Nokia 105 is targeted for emerging markets where spending money for the latest touchscreen handset is a luxury. Those countries include Africa, Latin America and India. The breakdown reveals that a lot of the cost savings on the Nokia 105 is due to Infineon Corp.'s PMB7900. This one chip combines the baseband and RF Tranceiver allowing for it to handle GSM/GPRS functions. Combining all of this on one chip allows Nokia to get away with including only three ICs on the phone. An earlier, similar model called the Nokia 1110 used to have six ICs inside. IHS analyst Wayne Lam sums it up by saying, "This is the fruit of nearly a decade's worth of integration. By riding Moore's law and holding the line on features, Nokia has gone from six discrete integrated circuits (ICs) to just one core device plus two other ICs." The three integrated circuits in the phone have a cost of $5.25, representing 39% of the cost of materials for the device. The color display, at $2.25, accounts for 17% of the cost of materials. By using a low end display with resolution of 128 x 128, Nokia can keep the price cheap. Besides the FM radio, the phone offers multiple alarm clocks, a speaking clock, battery life of 35 days and a flashlight. The device is also water and dust proof. These lower end models still account for the lion's share of Nokia's business. In the first quarter of this year, the company shipped shipped 5.6 million Lumia products, 500,000 Symbian-based devices and 55.8 million feature phones. You should be happy. I was surprised he knew the world didn't end at america's borders. I thought they are located in Europe. You know how they make a living? I do not see an commercial and such on this site. You don't see ads probably because you browse on mobile site. No, i browse on PC. Low end models still rock, because few people belive that a person should be smart rather his phone. This is a must have emergency phone. Great one still making profit. I heard lumia 520 has almost zero profit! Actually rumor has it the 521 due to similar efficiencies actually has a larger profit % than the 920 or 925, when you add the MS subsidy. Wow, that is cheap. Can't imagine building out a downstream for such efficient production and distribution. Efficient manufacturing and cost saving. The Nokia 105 is definitely a bang for the buck. Just purchased a black one two days back and I am amazed by the quality and feel of the phone. Very nice keypad and excellent battery backup. can someone tell me if this phone lags on modern combat 3? Should not. I tried crysis 3. Gave me 40 fps at medium settings. it cant run modern combat 3 (coz nokia doesnt allow it that is) but its battery was enough to power my laptop for 12 hours which does.